Easy Moving Labor in Bakersfield offers professional moving help to provide loading and unloading services of your rental trucks, pod style containers, trailers and overseas containers. 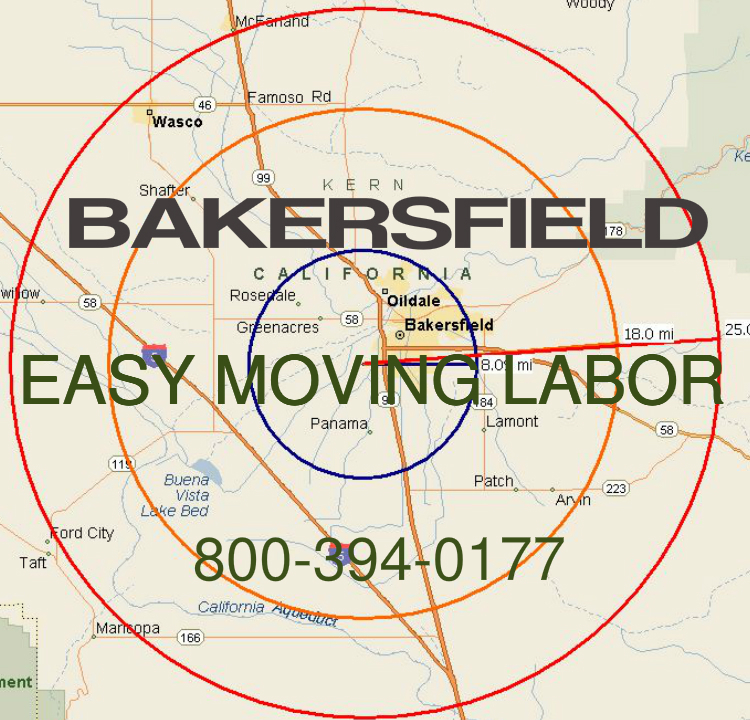 We provide moving labor throughout the Bakersfield area that includes Oildale, Wasco and Arvin. Our crews are well trained and can assist with all of your moving needs. We have done hundreds of jobs in the immediate Bakersfield area. Countless moving labor jobs in the surrounding areas have been completed. We travel beyond the area shown in the circle, but there is a slightly higher fee. Call us today. How does pricing on our maps work? In the map above, you’ll notice Bakersfield in the center of a Blue circle. This area has no additional travel fee, but does have the CA surcharge. Outside of the blue circle, but within the green circle has a $20 travel fee. Between the green and orange circles is a $30 travel fee. Between the orange and red circles is a $40 travel fee. The table below will give you precise pricing. Use the search box to find your zip code. If you’re moving locally, the farther travel amount will prevail. If over 20 miles, add $1.00 per mile to the amounts. Our time doesn’t start until we arrive, and ends when we are done. If you have questions or don’t see your location above or below, just call us and we’ll be happy to tell you just where your zip code lands. If you order online, we always give you a confirmation call, and if there is a travel fee, you’ll be advised right away. Since 1/1/17, all California jobs are assessed a $40 surcharge to compensate for higher labor costs than other parts of the country. Our pricing below includes the surcharge and all fees. 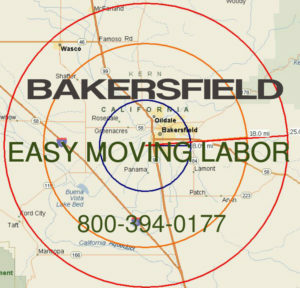 Use the search box to find your zip code and the exact Bakersfield moving labor pricing. If your zip code doesn’t appear in the results below, please click here to get a customized quote for pricing in your area.